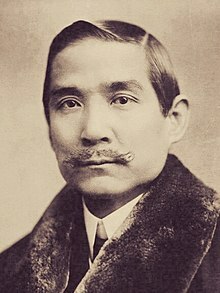 Sun Yat-sen (孫逸仙, November 12, 1866 – March 12, 1925) was a Chinese revolutionary leader and statesman who is considered by many to be the "Father of Modern China". He was known as several names including 孫中山 and 孫文. He had a significant influence in the overthrow of the Qing Dynasty and establishment of the original Republic of China. It is only after mature deliberation and thorough preparation that I have decided upon the Program of Revolution and defined the procedure of the revolution in three stages. The first is the period of military government; the second, the period of political tutelage; and the third, the period of constitutional government. To understand is difficult; to act is easy. This page was last edited on 5 September 2018, at 16:09.